It’s a common, simple question, but I have an uncommon and not-so-simple answer. “What’s your major?” my classmates ask. “I’m a seminarian,” I reply. 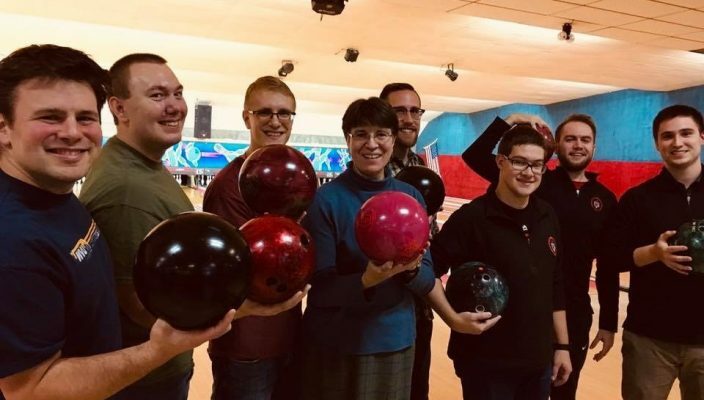 Currently, there are 13 of us attending classes at Gannon University while we live as a community at Saint Mark Seminary, which was founded by Archbishop John Mark Gannon in 1945, and has existed in its present location on East Grandview Boulevard since 1959. We’re from Erie, Buffalo, Rochester, State College, Greensburg and surrounding towns. Our ages range from 18 to 43. Some of us are true college freshmen, several have transferred from other colleges, others have previously earned degrees and spent time in the work force. What we have in common is that at some point, we felt a stirring in our hearts that God may want us to serve him and his people as priests for the Catholic Church. For a while, some of us denied or resisted that stirring for various reasons, but by the grace of God, we now find ourselves in the seminary. One definition of seminary, by the way, is a plot where plants are raised from seeds. At Saint Mark Seminary, we are the seeds. We are fed and watered spiritually through prayer, work, worship, instruction, study and community life. A standard weekday for us might include Catholic Mass in the early morning, classes and meals at Gannon between 8 a.m. and 3 p.m., praying the traditional prayer of the church — the Liturgy of the Hours — as a group, sharing dinner together and then using the evening for study and leisure time. Once every week, each of us participates in an “apostolic placement,” where we gain experience serving in environments such as the local hospital as assistants to the chaplain, homeless shelter, “Kids Cafe” program for inner-city children and L’Arche homes for adults with and without intellectual disabilities. In some ways, we are quite similar to our college classmates. We play pickup games of basketball, work out at the Recreation and Wellness Center, watch movies and sports together and celebrate each other’s birthdays. We drive home to spend time with family and old friends once or twice each month. Some of us are on the college track: We’ll spend four years here and graduate with a bachelor’s degree. Others are on the pre-theology track: because of our previous college experience, we’ll spend only two years at Gannon. After our time here is complete, many of us will continue our journey toward the priesthood by spending four or five years at a major seminary — perhaps in Baltimore, Buffalo, Latrobe or Philadelphia. Others will discern that we’re not being called to serve God through the priesthood, but in other ways. All of us, if we approach our time here with open, humble hearts and the desire to love and serve God, will leave here as better men. I truly wish everyone could have the chance to experience seminary life. It’s a unique, joyous opportunity to focus on becoming the best version of yourself, for the love of God and the betterment of humanity. But then, I realized God wants me for me. He takes me as I am and helps me to uncover my truest self. If you are open to reflecting and praying about entering seminary, come chat with the seminarians when you see us at Beyer Cafeteria, at the Rec, at Gannon’s Thursday Community Mass or in your classes. Talk with the Diocese of Erie Vocation Office (814-824-1200) and make an appointment to come visit the seminary and get a feel for our beautiful and adventurous journey. No matter the particular type of life each of us is called to, I believe all of us are called to holiness. That concept seems intimidating, but as renowned Catholic author Matthew Kelly reminds us, we can all grow in holiness by seeking and embracing holy moments: those opportunities in our day-to-day lives to love and serve God and his people in small but self-sacrificing ways. I’ll pray for you and your journey. Please pray for us and ours.